Wondering what to do with jicama? It’s delicious raw served in salads. Hence, I put together the following refreshing and SIMPLE salad to enjoy anytime…with a meal, as a snack, and even as a dessert if you don’t want something overly sweet. The salad blends the flavors of jicama, mango and carrots, all tied together with a sweet/sour mixture of lemon juice and maple syrup or honey. It’s delicious, colorful, refreshing, mildly crunchy, lightly sweet, and really easy to make! Below is a video where I demonstrate how to make the salad. Below the video is the written recipe. Enjoy! Combine vegetables in a medium size bowl; stir to combine. In a small bowl, combine the lemon juice and maple syrup or honey. Drizzle the lemon juice mixture over the jicama mixture; stir to combine. Cover and place in the refrigerator for an hour or two before serving to allow flavors to blend. Enjoy! 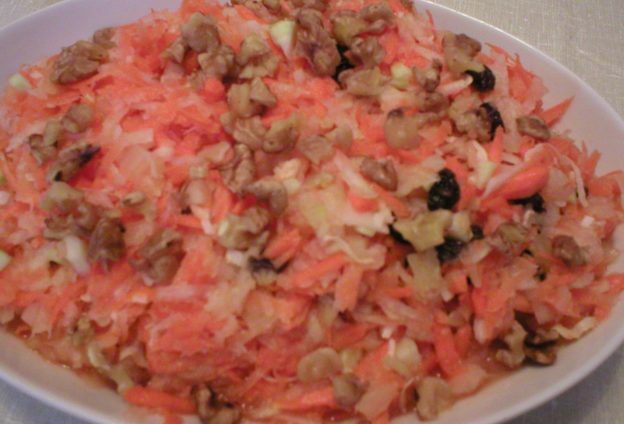 This entry was posted in Food, Salads and tagged carrot salad recipes, easy salad recipes, jicama mango carrot salad, jicama recipes, mango recipes on February 12, 2019 by Judi. Wondering what to do with kohlrabi? Well this interesting vegetable can be used in many ways. When used raw, kohlrabi can add a nice crunch to a salad. 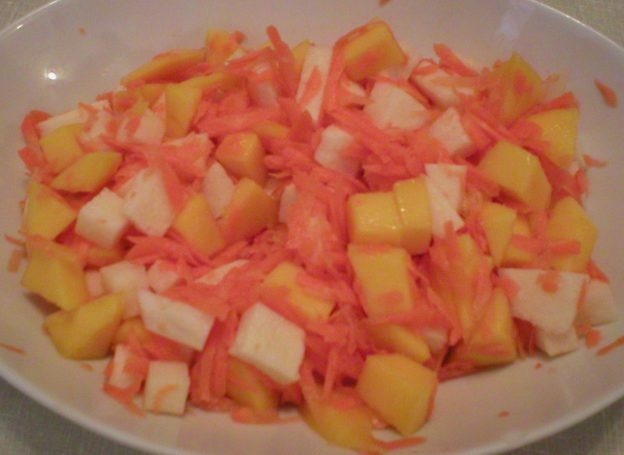 Here’s a recipe incorporating kohlrabi into a delicious and refreshing salad with carrots and pineapple. The recipe is below the video demonstration. Give this a try sometime. It’s delicious! Wash, peel and grate the kohlrabi into a large bowl. Peel and shred the carrots and add to the bowl with the kohlrabi. Add the raisins, coconut, and crushed pineapple (see note below about the amount of pineapple to use). Stir to combine all ingredients. Place in a covered container and refrigerator for 1 to 2 hours to allow flavors to blend. Taste the mixture. If more sweetness is needed, add the optional ingredients, if desired. OR add more pineapple. * If you want more pineapple flavor, you can use one larger (20 oz) can of pineapple packed in unsweetened pineapple juice in place of the 8 oz can. OR you can add any amount in between the two can sizes, to your desired flavoring. This makes a lot of salad. If a smaller amount is needed, simply use half the amount of ingredients. This entry was posted in Food, Salads and tagged carrot pineapple salad recipes, easy salad recipes, kohlrabi carrot pineapple salad, kohlrabi recipes, raw kohlrabi recipes on January 24, 2019 by Judi.